Pro-Morsi coalition calls for "third revolutionary wave"
Amid the preliminary results of Egypt's presidential poll announced on Thursday, a "third revolutionary wave" has been declared by the largest coalition supporting ousted Islamist president Mohamed Morsi. In a press statement, the National Alliance to Support Legitimacy (NASL) requested the military to "step back" and allow the Egyptian people to rule the country. Preliminary results of the three-day presidential election show that Egypt's 27 governorates favour Abdel-Fattah El-Sisi, who collected over 96 percent of the vote. El-Sisi's only contender, leftist politician Hamdeen Sabahi, garnered a humble 3 percent, with less than 800,000 votes. 3.7 percent of the ballots were void. "We are calling on all Egyptians to carry on with their revolution that initially aimed for freedom," the NASL statement quoted. The alliance also claimed that a "low turnout" of the presidential polls evidenced the Egyptian people's will to reject what it described as the "military coup" that ousted Morsi. However, contrary to to the NASL's claims, preliminary results showed a relatively high turnout of 46 percent. The statement also asked Egyptians to protest in all governorates around the country against the elections and the "coup". Last week, the pro-Morsi alliance had also claimed that a "low turnout" of the expat voting -- which took place from 15-18 May – declaring it null and void. However, again contrary to NASL assertions, the number of expats who voted in the 2014 poll exceeded that in the 2012 presidential elections that brought Morsi to power. 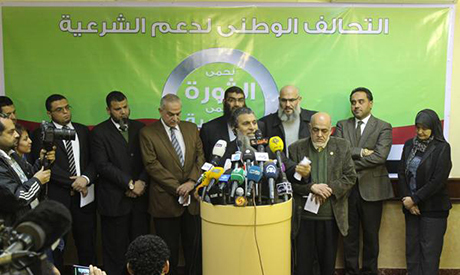 The Muslim Brotherhood-led coalition insists Morsi is Egypt's legitimate president. The group describes Morsi – who currently faces multiple trials on charges including murder and espionage – as the "kidnapped president". El-Sisi, in his former capacity as the country's defence minister, had led Morsi's removal following mass protests against the Islamist president's troubled one-year rule. Despite the dwindling numbers of Morsi supporters in street protests – now mainly confined to some Egyptian universities – the NASL consistently claims the momentum of its demonstrations remains undeterred. i hope these people asking to put Egypt back to chaos again think really hard. Protest is good if it will benefit the whole country but if it's only for a few people, it does not make sense. Country will not move forward amidst chaos. Having a new president is a good start especially a strong one like Sisi. They just decided to use other than pencil and paper to vote. Rather they used bombs, weapons, blood and terror to mark their ballots. The Egyptian people who gave President-elect Sissi, our hero, our national "zaiime' more that twice the votes morsi obtained fraudulently if only because he hid the fact that he was an escaped criminal felon, the Great Egyptian people is taking good notes. Tahya Masr! The pathetic defeated terrorist organization panting for its last breath. Egypt defeated you with its greatest ever General and it's Army. The financial help you got from Kadafi is dried up. And Qatar is about to give up on you after it's reputation as a terrorist supporter got a beating from the gulf states. Time to shave your beards and get constructive jobs, instead of working to destroy Egypt . Who are you calling legitimate? Morsi (the selected spare tire and not elected) broke out of jail by force on January 28, 2011 amid the security vacuum that ensued after MB gangs attacked and burned down police stations around the country, at the first days of the 2011 revolution. Now Morsi is detained, pending investigations over crimes of collaboration with foreign intelligence, jeopardizing Egypt’s national security and illegally breaking out of jail. And in any respected democracy, runaway convicts don’t run for presidency. Now you crave for chaos to covertly install another convict or foreign controlled pupped under the "legitimacy" banner? Using religion to escalate to power for your own gains has negative accountability infront of Allah in this world. Your worst nightmare will again be the Egyptian people as it was during the June 30th 2013 revolution. ... National Alliance to Support Legitimacy (NASL) ...NO...and NO..YOU ARE DONE. AND FOREVER. NO MORE THUGS...WITH BEARDS.